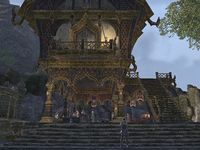 Moonfire Forge is an open-air terrace in Mistral which houses various vendors' stalls along with blacksmithing and clothing stations. It is situated under the Ladrelas' House. There are several storage containers on the premises along with freely available pieces of weaponry and armor. Three books can be read here: A Clothier's Primer, Blacksmithing Basics, and Bolga's Guide to Island Beasts. Molwen can be encountered here, talking to Climbs Trees. Moonfire Forge - A blacksmith stall run by Pamaea. Bone-Awl Outfitters — A stall owned by the leatherworker Firagaer. Fang & Claw — A weaponsmith stall run by Munanir. The Glass Bobbin — A stall run by the tailor Noryariel. Iron Bark Plate and Mail — An armorer stall owned by Ladrelas. Skins & Satin — A stall owned by the clothier Samsu the Sleek. Two Mistral Guards patrol the area.